The altered V4smpl texture is done with a daz original and will stay in Daz's Texture Folder. aquatick (2 years ago) Inappropriate? Awesome! Beautifully crafted, thank you very much!!! My first suggestion would be to put the word "asari" in the name of this prop. Without renaming it it would be really difficult to find it in my extensive runtime. eroknight (4 years ago) Inappropriate? LadySythe (6 years ago) Inappropriate? Hmm cool :) There is another version of this as a full texture and head piece for V4, but I'll play with this too :) Thank you! OH! And you can still find JoeQuick's stuff. He just moved his freebies around into collections. Thorak (6 years ago) Inappropriate? Youre welcome, guys :) @Shante, i dont have any expirience in texturing things, i'll learn it, promised ;) But thank you, for mentioning that, so i learn to get better. But for now i'm in Holidays for 2 Weeks, wish you lots of fun and good days. When i come Home again, maybe i'm gettin harder into this. TerryMcG (6 years ago) Inappropriate? shante (6 years ago) Inappropriate? if i may make little observation, though it can certainly be done in post production, adding a bit of a transmap to the head piece to make softer transition into head and less obvious seam where they meet, would have been nice finishing touch. for first time work though very good. ChupaCabra555 (6 years ago) Inappropriate? hisstoryman (6 years ago) Inappropriate? Excellent work! Can't wait to use it. Projectionist (6 years ago) Inappropriate? 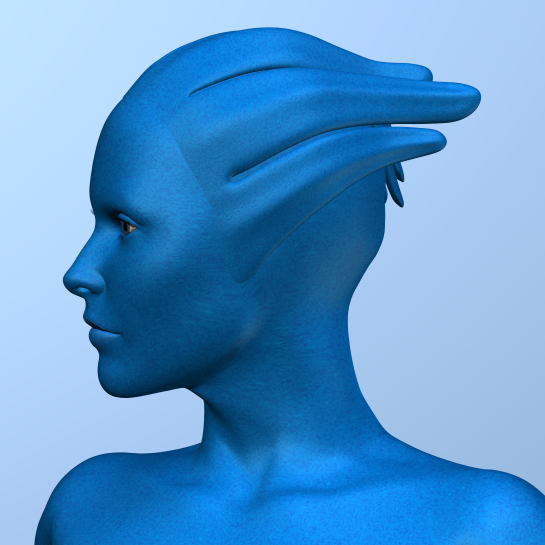 Great got a head Morph for an Asari a while back this is even better still,many thanks. drpochi (6 years ago) Inappropriate? You're welcome, i hope all runs fine? @all : Give me some Feedback pls. Would be very nice to know, if this works fine in other Poser Versions, too. Thank you for your creative generosity. Please add a download button.